EyHost Review 2019: Is EyHost a Good Hosting? EyHost is a Bangladesh-based host with some good selling points. Whilst you might miss SSH access or dislike servers colocated in other data centers, you’ll definitely be impressed by their 100% uptime SLA. Bangladesh-based EyHost has been selling website hosting since 2010. Their servers are colocated in European, Asian and U.S. data centers, and they host 10,000 websites for more than 3500 customers. I am incredibly impressed with EyHost’s 100% uptime SLA. Although I’m usually very skeptical of companies that advertise 100% uptime guarantees, in this case, the company backs it up with a detailed SLA that compensates you in the event of any downtime. This is extremely rare and is probably their primary selling point. All shared hosting plans come with a drag-and-drop website building tool and the Softaculous one-click installer for popular programs. I don’t know how many programs; nor did their live chat support agent. The hosting plans are also fully compatible with popular CMS software such as Joomla, WordPress, and Drupal. EyHost uses the reliable and easy-to-use cPanel and WHM control panels, and they have created a user area where you can manage your bills, domains, support tickets, and so on. I’ve not been able to take the control panel or user area for a test-drive, but from the pictures I’ve seen, I can tell you that they have nice looking interfaces. There are some e-commerce features such private and shared SSL certificates plus integrations with osCommerce and ZenCart. Developers will like the support for PHP version 5 (but not as much as if it was version 7) as well as the support for other advanced coding languages including Python and Ruby on Rails. Given the level of features for beginners, experts, and e-commerce entrepreneurs, I’m pleasantly surprised by EyHost’s prices that are in line with (if not lower than) competing hosting companies. And there’s even a 30-day money-back guarantee so you don’t need to worry too much about signing up. Plans can be bought on one-month to three-year terms. You get a minuscule amount of money off for purchasing the longer term, but it wouldn’t be enough to tempt me into a three-year commitment. There are quite a few paid add-ons on offer at the checkout, but their prices are fine. I’m talking about things like dedicated IP addresses and professional SSL certificates. You can access 24/7/365 support by telephone, ticket, email, or live chat. While the phone and live chat options allow you to summon immediate assistance (I’ve tried), you should also receive a response to a support ticket within fifteen minutes. For those of you who like to support yourselves, EyHost provides an extensive knowledge base and an FAQ page. I’ve been able to find answers to many of my questions without having to contact support at all. It’s unusual to find a company with so many plus points. I could complain that their servers are colocated in someone else’s data centers or that they offer no SSH access, but I won’t because I’m already sold on their 100% uptime, 24/7 customer service, and features for both beginners and experts. 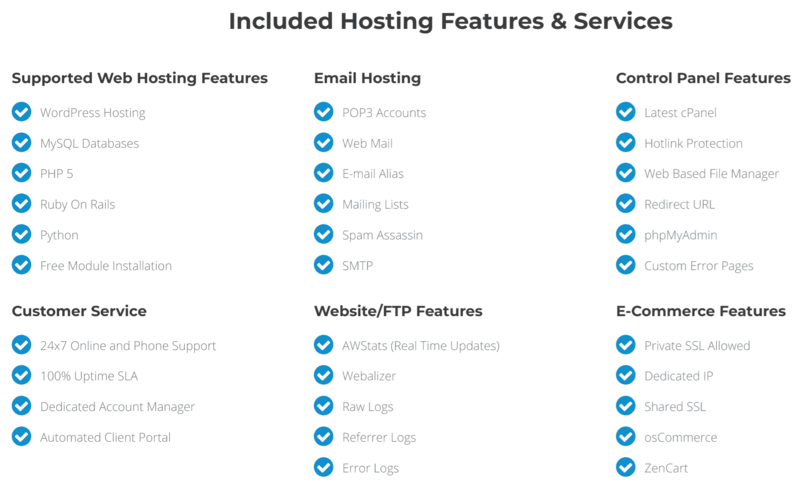 Wondering how EyHost stacks up against other Web Hosting companies? Enter any other Web Hosting company and we will give you a side-by-side comparison.